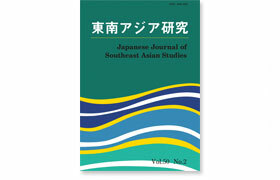 Electronic reproductions of Southeast Asian Studies from the inaugural issue through Vol.52, No.2 (January 2015) are available. Copyright of all manuscripts is assigned to the Center for Southeast Asian Studies (CSEAS), Kyoto University. Individuals are free to view, reproduce, and print out whole or partial copies for private, academic use only. This consent does not extend to other kinds of reproduction for non-academic purposes, such as reproduction for commercial, advertising, and promotional purposes, or to any form of reproduction, printing, or general distribution that exceeds the limits of personal use. All such acts constitute an infringement of copyright and are strictly prohibited. Volume 1, Number 1 through Volume 39, Number 2 were scanned at the National Institute of Informatics (NII) for CSEAS. We would like to express our thanks for their cooperation and kindness. Volume 39, Number 3 through the present issue are PDF files made by CSEAS from the original manuscripts.